SSC JE 2019 Exam Pattern, Syllabus, Best Books and Papers Free Pdf Download. SSC Jen Exam 2019 All Paper Pattern, Syllabus, Best Books, Previous Cut-off, Previous Paper Detail, Notes & E-books MCQ Free Pdf Download for Electrical, Mechanical, Civil Engineering. This article also provides you SSC JE electrical, mechanical, civil previous year exam papers with solution pdf, previous years SSC JE exams previous cut-off and expected cut-off SSC JE 2019 for pre main exams, Best Books for SSC Junior Engineer 2019 for Pre and Mains. SSC JE Previous Year Questions Papers 2017, 2018 pdf and SSC JE Questions Papers Pdf With Answer Key For Electrical, Mechanical And Civil Engineering Free Pdf Download, SSC JE Technical & Non-Technical Notes & Books Hindi And English for PRE-& Mains Exams Free Pdf Download. If you are preparing SSC JE 2019, this article very helpful your exams preparation. Staff Selection Commission (SSC) has recruited the posts of Junior Engineer in this year 2019. All the diplomas and degree holders can apply. This recruitment Staff Selection Commission conducted for the posts of electrical mechanical and civil engineering for junior engineers. You can read my previous article SSC JE Recruitment Notification 2019 - Apply Online, Exams Date, Admit Card for official information and How To Apply, Exam Dates for SSC JE 2019. You can download here SSC Jen Exam 2019 All Paper Pattern, Syllabus, Best Books, Previous Cut-off, Previous Paper Pdf, Notes & E-books MCQ Free Pdf Download for Electrical, Mechanical, Civil Engineering. In the table below, you will find information about the Exam pattern of SSC JE 2019. In this table, you can see that the Examination of SSC JE 2019 will be in two parts, where in the first part will ask you the questions of the Objective Multiple Type, the other part will ask you the Subjective Type questions will be asked. This SSC JE exam will conduct in two papers, paper-1(pre exam) and Paper-2(main exam). Paper-1(objective type): computer base mode exam. This exams have three part, (i) General Intelligence Reasoning (ii) General Awareness (iii)General Engineering (civil/electrical/mechanical). Exams Duration for paper-1, 2 hours (120 minutes) hours. Note: There will be negative marking of 0.25 marks for each wrong answer in Paper-I. Paper-2 (Conventional Type): after pass paper-1 with minimum cut-off marks you can give paper-2. The paper-2 will be conducted in fully offline mode in exam center will give your paper and pen to write the exam. The question will ask your related branch electrical, mechanical, and civil. See below table for more information. If you want to download Syllabus and Exam pattern of SSC Junior Engineer Examination 2019 then you can download from the table below. In the table below, you can download SSC Junior Engineer Examination 2019 for all branches PDF, from below table you can download SSC JE electrical, mechanical and civil engineering syllabus in Pdf. SSC JE 2019 Electrical Engineering Syllabus & Pattern Pdf Download. 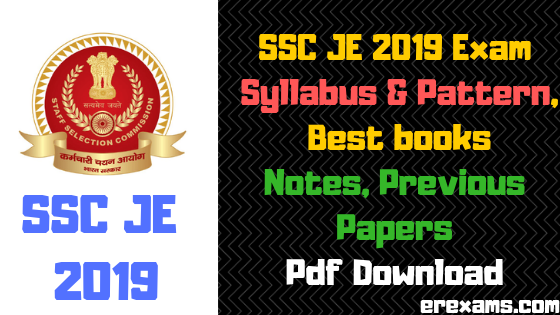 SSC JE 2019 Mechanical Engineering Syllabus & Pattern Pdf Download. SSC JE 2019 Civil Engineering Syllabus & Pattern Pdf Download. If you do the preparations for the SSC Junior Engineer 2019 with good books, you will definitely get success in the SSC Junior Engineer Examination. I have written two articles for Best Books for the SSC JE 2019 examination, where in the first article written the SSC JE Best Book for Pre-Examination 2019 for Electrical Mechanical and Civil Engineering and the second article for SSC JE Best Book for SSC JE Best Book for Mains Exam 2019 is written for Electrical, Mechanical and Civil Engineering. You can read the article through direct links from the table below. SSC JE Previous year 2012-2017 Cut-Off or Merit List Previous Junior Engineers (Civil, Mechanical, Electrical and Quantity Surveying & Contract) Examination, 2017 was conducted by the Commission from 22.01.2018 to 29.01.2018 in various centres all over the country. A total of 5,69,930 candidate appeared in this Examination. Below table give you detail information previous year 2012-2017 cut-off marks Electrical, Mechanical, and Civil Engineering. Here below table provides you Non-Technical Notes & Books Hindi & English. You can download non-technical notes and books for the SSC Examination 2019 from the table below. Here I have provided the all notes and books of SSC JE 2019. You can download all the PDFs by clicking on the Direct link below table. Here below table provides you SSC JE 2019 Technical Abilities Study Material Notes & Books Pdf Download for SSC JE 2019 for Electrical Engineering, Civil Engineering and Mechanical Engineering. I hope above SSC JE 2019 preparation materials – Syllabus and exam pattern, best Books, previous papers, cut-off, notes, E-books for SSC JE Exam you could at least get some direction on how to prepare. If you face any problem related SSC JE 2019 exam comment below. Best wishes for the exam! I hope SSC JE 2019 Syllabus & Pattern, Best books, Previous Papers, Notes & Books Pdf Download article help you prepare your SSC JE Exam 2019. I hope above SSC JE 2019 preparation materials – Syllabus and exam pattern, best Books, previous papers, cut-off, notes, E-books for SSC JE Exam you could at least get some direction on how to prepare. If you face any problem related SSC JE 2019 exam comment below. Best wishes for the exam. does an electronic engineer can apply for it ?